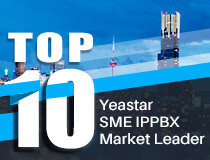 Yeastar S-Series VoIP PBX provides Auto Provisioning App to help you set up IP phones and Yeastar VoIP gateways in bulk. Using auto provisioning, you can instruct phone or gateway to retrieve its configuration from Yeastar S-Series VoIP PBX system. Once you provision a phone/gateway, the phone/gateway will automatically configure itself correctly and you will be able to manage the phone or gateway centrally without having to log in the phone’s or the gateway’s web interface one by one. DHCP – Yeastar gateways and all supported IP phones could use this method. This method is typically for legacy phones (from a previous PBX installation, e.g. Cisco, Aastra or Polycom) can be provisioned via DHCP method only. Make sure that the phone/gateway’s PnP feature is enabled. By default, the PnP is enabled in Yeastar gateways and most of IP phones. Configure the phone/gateway on the “Auto Provisioning” page. Click “Save” and reboot the phone/gateway. If the phone you are using does not support plug and play, you can use DHCP mode to do auto provisioning. Enable "DHCP Server" in Yeastar S-Series PBX (Settings > System > Security > Service), make sure that the PBX is the only DHCP server in your local network. Set the phone network mode as “DHCP”. By default, DHCP mode is enabled by most IP phones. Configure the phone on the “Auto Provisioning” page. Click “Save” and reboot the phone. Terrific article Lucas. Yeastar has some of the best documentation and easy to follow instructions for setup and maintaining the phone system. We had quite a few users in Canada asking about Auto Provisioning phones and so I created a YouTube video. I wanted to share it with you.